If you have been following me on Snapchat over the past year you’ve noticed that one of our favorite things to do as a family is make HERSHEY’S S’Mores in our backyard! I grew up on the gooey, yummy treats; we always made them in the summertime sitting around our fire pit. It’s one of the most distinct memories I have with my sisters and dad. We had a trampoline tent and would make S’Mores together before we went to bed (I guess when you’re a dad to all girls you camp in the backyard instead of the woods ;). We would talk and laugh for hours on end! When I’m at my parents house and my dad isn’t home to start the fire (I can never figure out how to start my parents fire pit) my sisters and I will still make a S’More together in the kitchen. 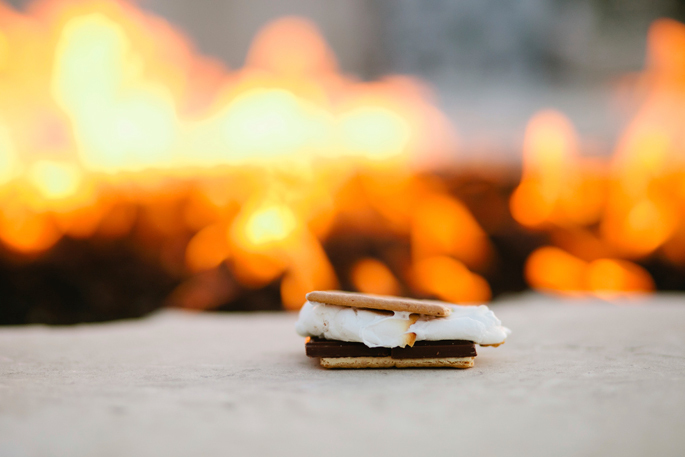 We would rather eat a S’More for a treat over ice-cream! 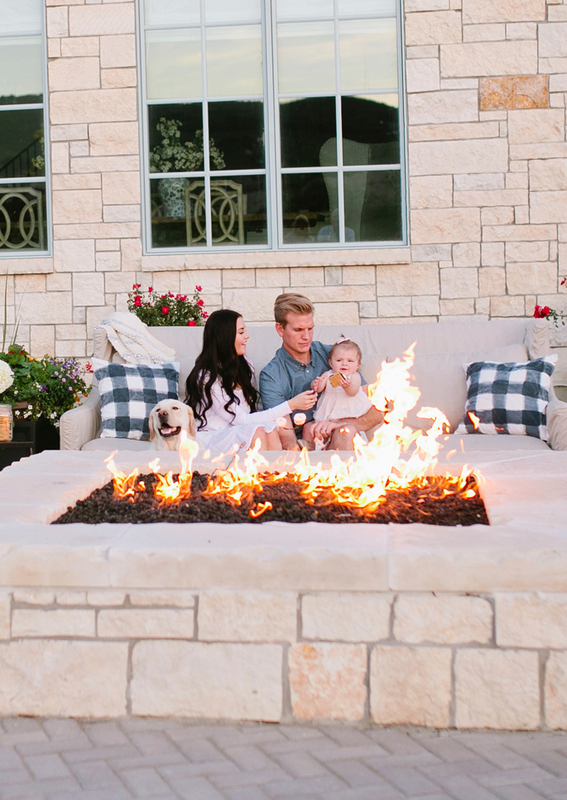 A lot of my fondest family memories relate back to S’Mores, which is why Drew and I decided to build a fire pit in our backyard so we could carve out sweet moments like these to choose happiness with our own family. It was a must-have for me, and we have gotten SO much use out of it! 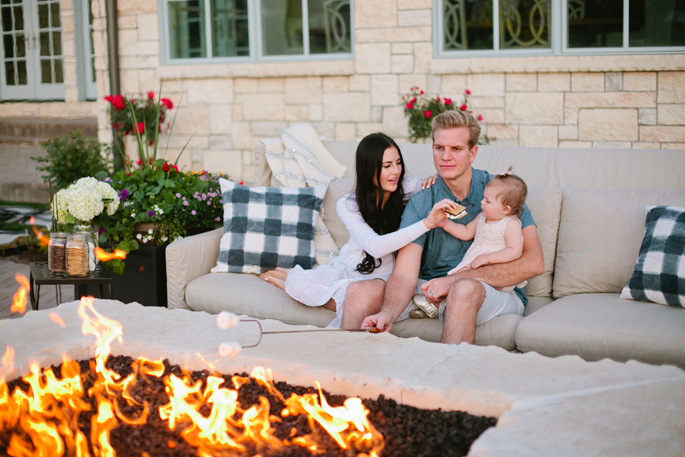 We’ve had so much fun continuing our family tradition of making S’Mores around our own fire pit and spending quality family time cuddled up around the fire. 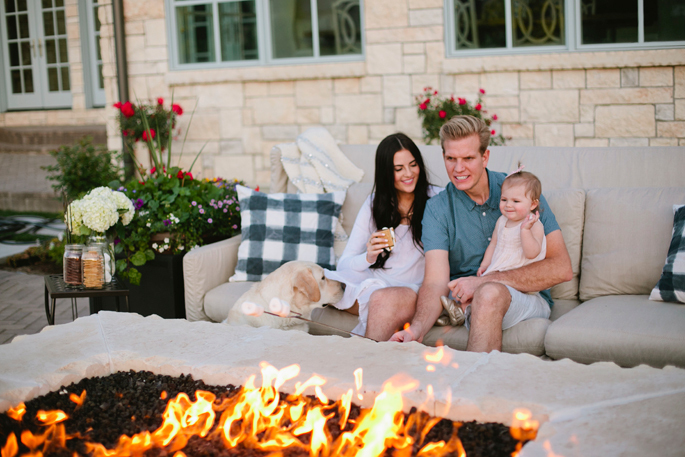 We decided that with Memorial Day Weekend coming up, the timing couldn’t be more perfect to spend a little extra family time around the fire pit. Isla loves to take bites of mine and Drew’s, and Dash of course tries to steal the marshmallows any chance he gets! 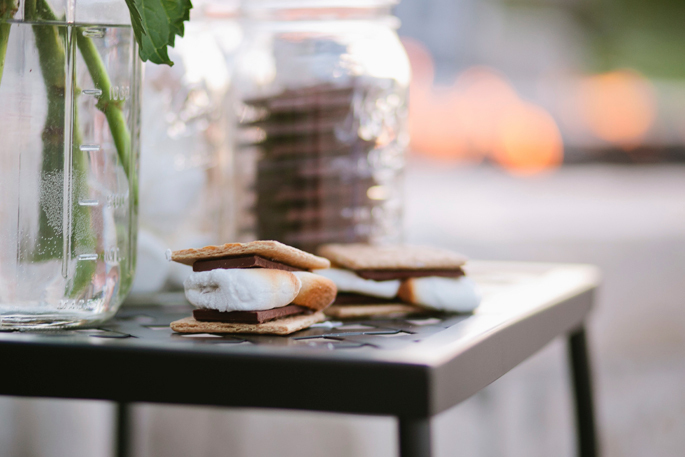 We are definitely craving summer over here, and we cannot wait to keep having our ‘Hello Happy Moments’ all summer long making S’Mores!!!! 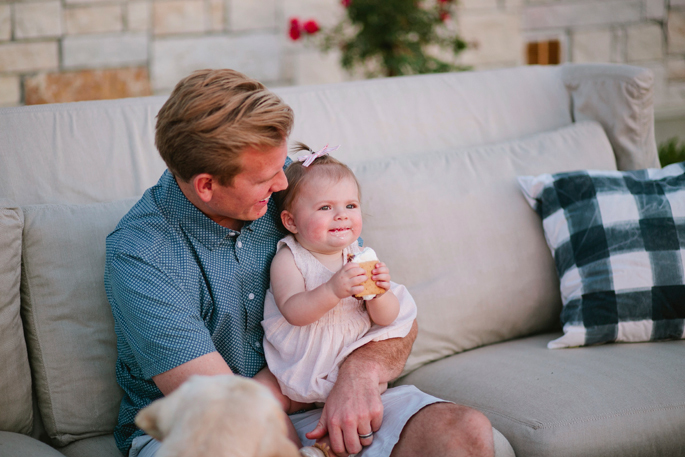 What are some of your favorite treats for summer?! Brought to you by The Hershey Company. That fireplace is to die for!! Wish I’d have this in my backyard, so cozy and perfect to sit around with your loved ones and eat S’Mores (now I really crave them)! Where’s the jealous alert?? Rachel your life is a dream to many readers and we love to see bits and pieces of your life. I love your sisters, your family, your house, your rooms, your life your everything!!! I really enjoy reading how your celebrate life even more than your fashion posts!!! Show us more! Aww this is such a gorgeous post! What a gorgeous family moment. So cute!! I love s’mores dates! 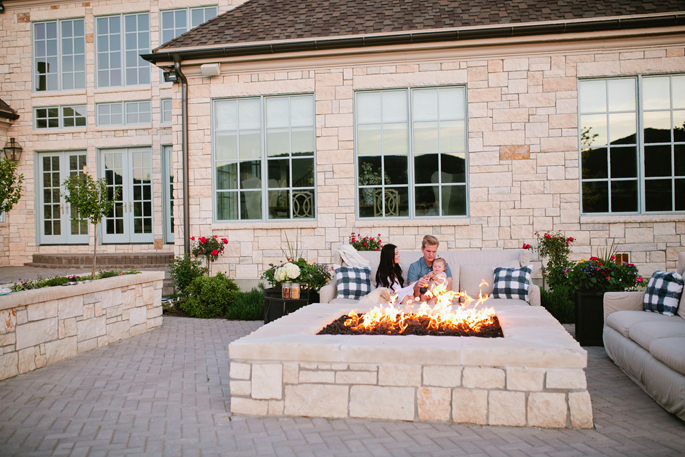 Love your fire pit! It’s amazing! If I had a backyard like your’s I’d use it every chance I could get! Awww!!! Too sweet photos!!! You’re right, that’s the best dessert ever, so simple but so delicious! S’mores are my absolute favorite treat!!! We’re having a patio and fire pit installed in our backyard this week and the first thing I’m going to do is make s’mores for the family!! Love this! We LOVE going out back and making S’Mores!!! I’m so glad we decided to put a fire pit in our backyard! This is so sweet! 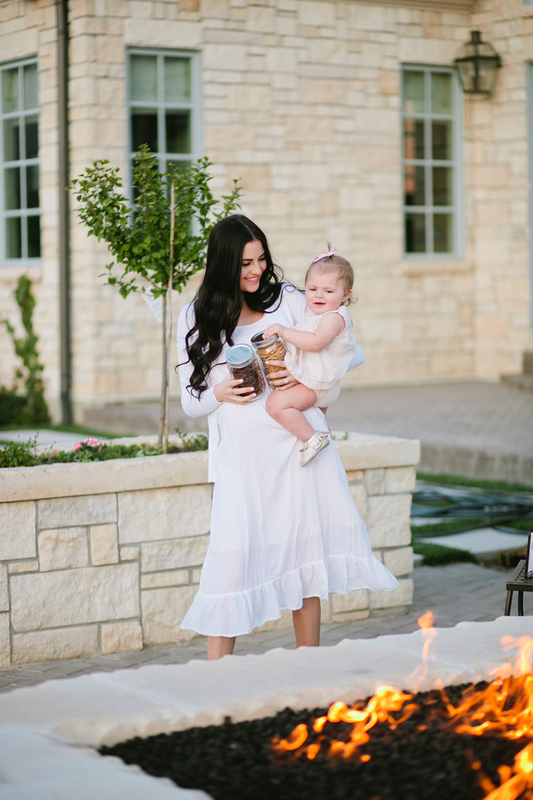 I love making s’mores too, it is such a fun family tradition! I recently stayed at a resort and every night they do s’mores by the fire and it was so fun! I almost forgot how delicious of a treat they can be! Loving these photos! 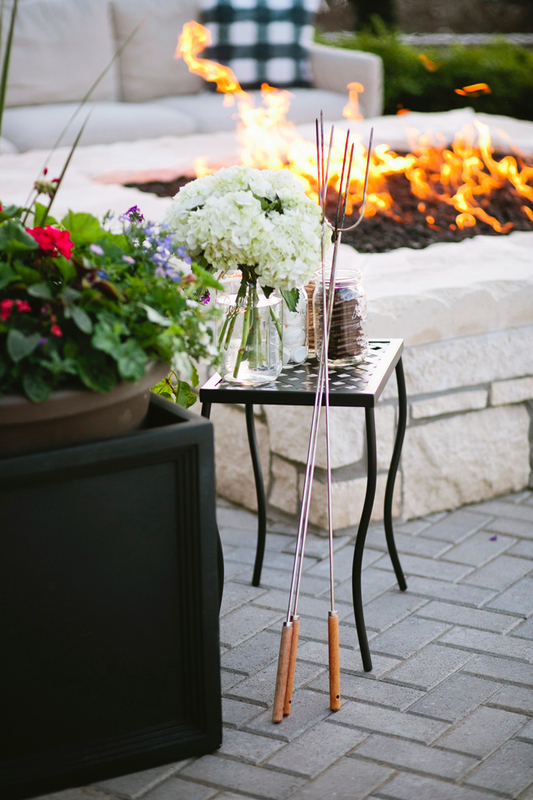 I love a good fire pit and s’mores combo! This is adorable! Love your backyard patio by the way!! Absolutely love this fire pit! What a fun summer night! Dash got a few bites that Isla Rose dropped!! haha :) Thanks Mia! Great summer family activity!! Your home is beautiful. What a great family tradition. S’Mores are the best! I LOVE s’mores! I have so many memories attached to them as well. And your backyard looks heavenly! Thanks Brett!! Aren’t they the best? What a wonderful & yummy family tradition! Hope you and your beautiful fam have a great Memorial Day weekend!! Thank you :) Same to you Danielle!!! Your backyard is a dream!! Love it rach so cute! Hope you have a lovely day! Smores are ALWAYS a good idea. Love your backyard set up too! I LOVE your home and fire pit setup! Also speaking of snapchat I was dying over Isla yesterday– that snap of her leaning on Dash was the cutest!! Love your backyard!!! 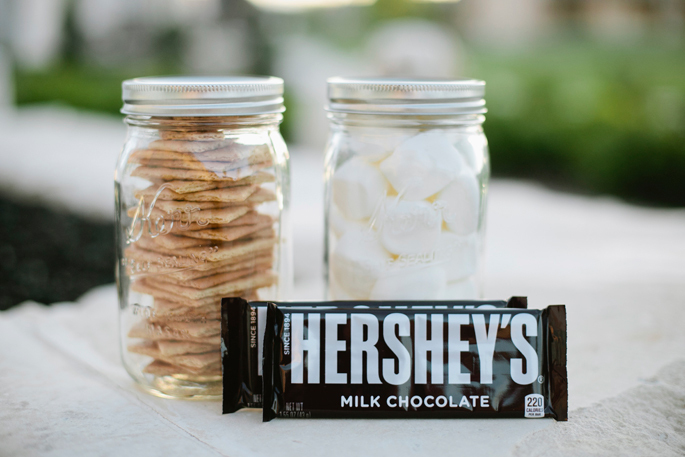 S’mores are a big thing in our family especially over the summer and even in winter. Light up the fire in our backyard and eating s’mores we forget about how cold it is. 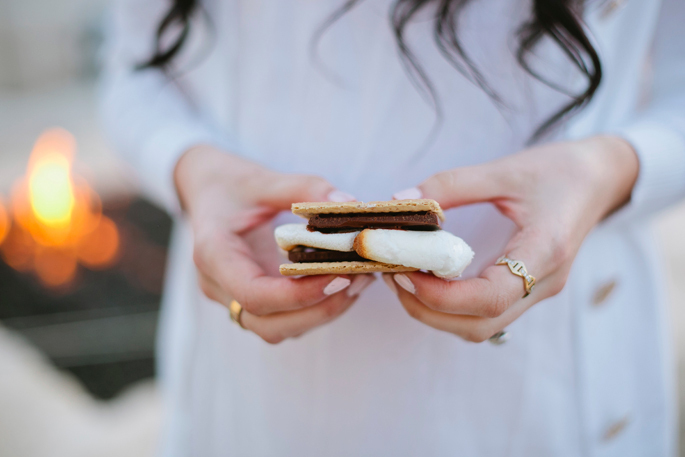 love s’mores & your backyard is to die for! I always feel so delighted to see you Rach…your Photos are superb and you are darn cute and Gorgeous… Congratulations once again…..
My family’s favorite summer treat is a spin on the traditional Rice Krispie treat. So you make one layer of traditional Rice Krispie treat, once that layer has cooled, sprinkle marshmallows all over to create a marshmallow layer. Then for the caramel layer. Melt a bag of caramels, butter and sweetened condensed milk and pour over marshmallow layer. Put in the fridge to cool completely. Lastly, make another batch of Rice Krispie treats and layer over the caramel. Keep refrigerated until you want to eat. Once you take out if the fridge the caramel will start softening. In my opinion, these are best eaten after they’ve been out of the fridge about 15 minutes. ? Oh my gosh that sounds amazing!!! Thanks for sharing Emily :) We’re going to have to try those!! Ahh yum!! This looks good! These pictures are too cute! 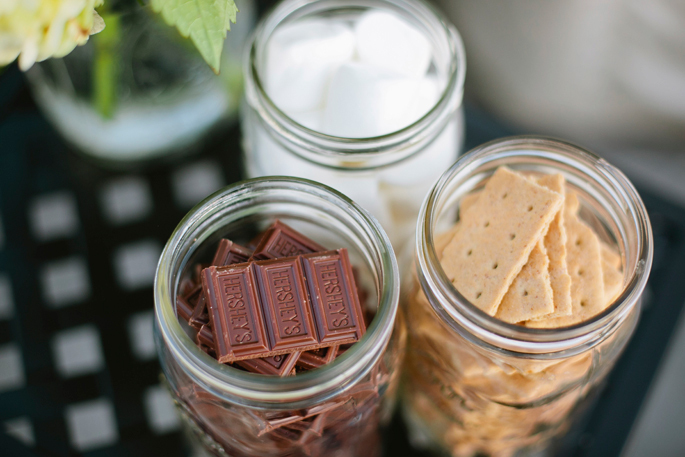 I love how you organized the chocolates and graham crackers in the mason jars. Nothing better than smores on a summer night. Loving these pictures! Love your dress! Looks bump friendly. Can you please share where you got it? Thanks!! OMG Isla eating that s’more just melted my heart!!! Ohh that looks delicious! 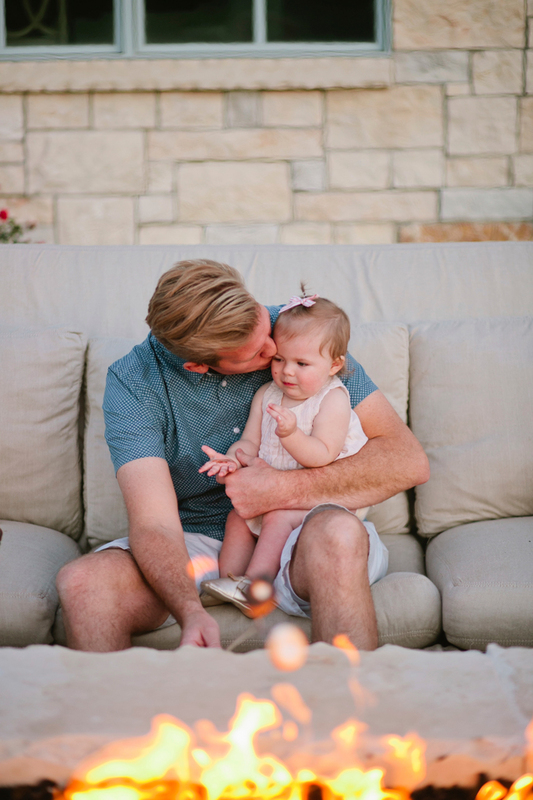 Love these photos too, so cute and you’re a very cute family! Yummy S’mores! That looks like so much fun! I love your dress and it would be so perfect for my newborn pics. Would you mind sharing where you got it? Thanks!! Omg, Isla is too cute eating that s’more! You guys are the cutest! Isla is just the cutest little thing ! What a stunning yard. Is the firepit gas rachel? Thank you Heidi!! Yes it’s a gas fire pit. Thanks for sharing this sweet memory! 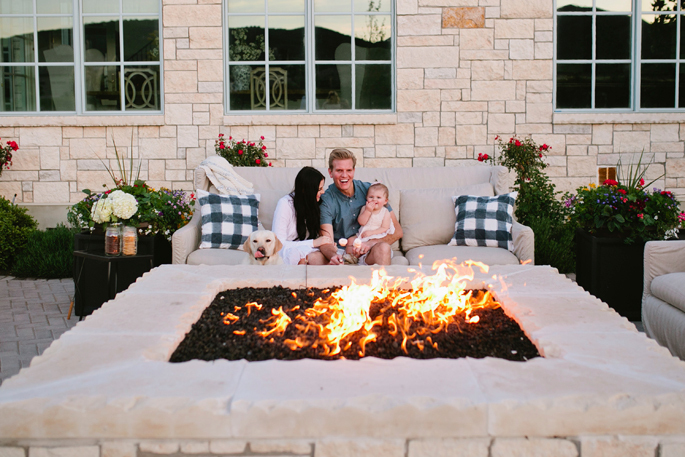 So fun you get to recreate with your own babies <3 And your firepit is gorg!Inspo! I wish I had a fire pit like this in my yard! Beautiful pics. Can you tell me where you got the s’mores sticks please? I began reading your blog because I enjoyed your personal style but over time it’s the lifestyle pots likes these that I really like most, I like hearing about your family’s traditions. I was never really raised with a lot of them, but do have great memories of weekend family getaways and holidays. 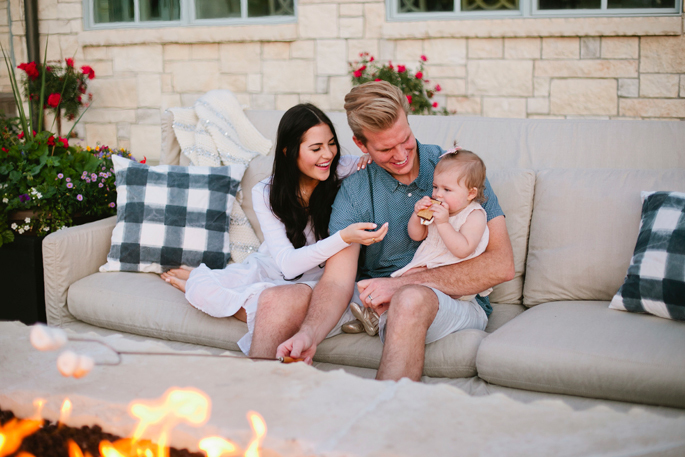 It makes me want to start more with my own family and s’mores are always a good idea. The problem is they are so addictive which I’m sure you’re taking advantage of while prego! yum yum, can baby eat them yet? has she grown teeth yet? Beautiful family. 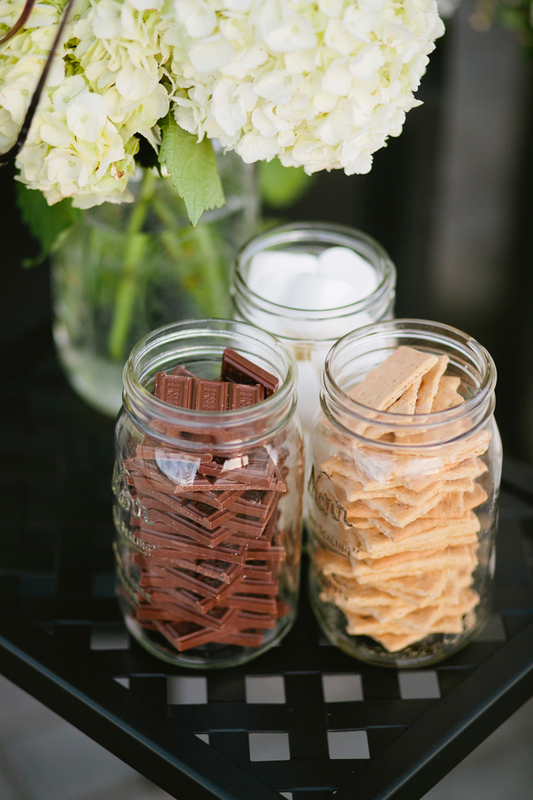 This post has me craving chocolate BAD! I love your fire pit! It’s so cool and unique! Love the pillows on your outdoor furniture, where can I find them? Your family is absolutely adorable! I love your outdoor couches – where can I find them? Hi Rach, would you please share how you protect your outdoor furniture cuhions from the rain? Do you take them in every night? Thanks for the tip.